Regional Counsil of Satakunta will meet you at the Pori Airport. There is a charter bus to Honkajoki. After visiting the Kirkkokallio at Honkajoki, the bus continue travel to the conference venue and to the conference hotels. 8:00 p.m. - 10 p.m. Get Together Party at the Restaurant Frami (address: Kampusranta 9 B, Seinäjoki). Dress code: smart casual. Get together party is hosted by Antti Pasila, Dean, Seinäjoki University of Applied Sciences - School of Food and Agriculture. The VOCAL! choir performs twice. Food Province represents the entire food chain and culture as well as associated competence and business promotion in South Ostrobothnian region. Local products are sold here – great possibility to purchase souvenirs from South Ostrobothnia! "The EIP-AGRI and the EIP-AGRI service point"
"Co-operation and innovation in RDP Mainland Finland"
Choose the best topic for you, participate and have a fruitful discussion with the experts. "Greenport Westland-Oostland and other Greenports in the Netherlands: Greenhouse horticulture clusters with ties unparalleled anywhere else in the world. A regional approach." "From consumers into food citizens through education"
"Food Province - Building platform for the future innovations in food"
"Regional economic impacts of food production and local food purchases by public kitchens - regional study cases from Finland"
"Sustainable practices in viticulture and ecology"
"Development of Water Protection in agrarian Areas along Waterways in Saarijärvi, Central Finland"
"How we meet Ecological Challenges in Horticulture?" "Small Smart Farm: support system to small and family farms in food production and land care"
"Multipurpose valorisation potential of food processing by-products – A review of past, present and emerging strategies in Europe"
"Food and nutrition expert views on the identification of food reformulation issues regarding the healthier"
"MAITO – MILK. Dairy Development in North Savo"
"Safety, convenience and reliability: state-of-the-art crop protection"
"A Finnish-Italian collaborative project by the groups of: Reproductive safety of food and processes in food industry"
Company presentation and tasting. Punainen Tupa wineyard is specialized in wines made in Finnish berries (red-, white- and blackcurrants and berries from forests). Local wineproduction, storing and handling of raw materials and semifinished products are all located in wineyard's premises in Alajärvi, South Ostrobotnia. Company presentation. The Pellon-Group offers complete solutions for the needs of dairy, pork and beef production as well as stables and indoor riding arenas. Charter busses will transport visitors to the hotels after visits. 7:00 p.m. A charter bus to the Törnävä Manor departs from the Cumulus Hotel Seinäjoki. Route: Cumulus Hotel Seinäjoki - Sokos Hotel Lakeus - Sokos Hotel Vaakuna. Seinäjoki City Reception is hosted by Kati Ojaniemi (Chair of the Seinäjoki City Counsil), Jorma Rasinmäki (Mayor of the City of Seinäjoki), Harri Jokiranta (Deputy City Manager), Erkki Välimäki (Development Manager) and Leena Perämäki (Deputy Director, Business). 9 p.m. A charter bus to the conference hotels departs from the Törnävä Manor. Route: Cumulus Hotel Seinäjoki - Sokos Hotel Lakeus - Sokos Hotel Vaakuna – Törnävä Manor. "Sustainability as a national priority in the Finnish food chain"
Conclusions of the parallel sessions presented by chairpersons. Discussion of the common innovation and research priorities. Meet conference participants, find project partners and share your ideas. Discuss with e.g. Outi Suomi, Senior Advisor in Horizon 2020 BIO-NCP, Tekes - Finnish Funding Agency for Innovation. 3 p.m. A charter bus to the railway station departs from the conference venue. Open wireless network is available in the conference venue: "Tervetuloa Framiin"
The conference is interactive. 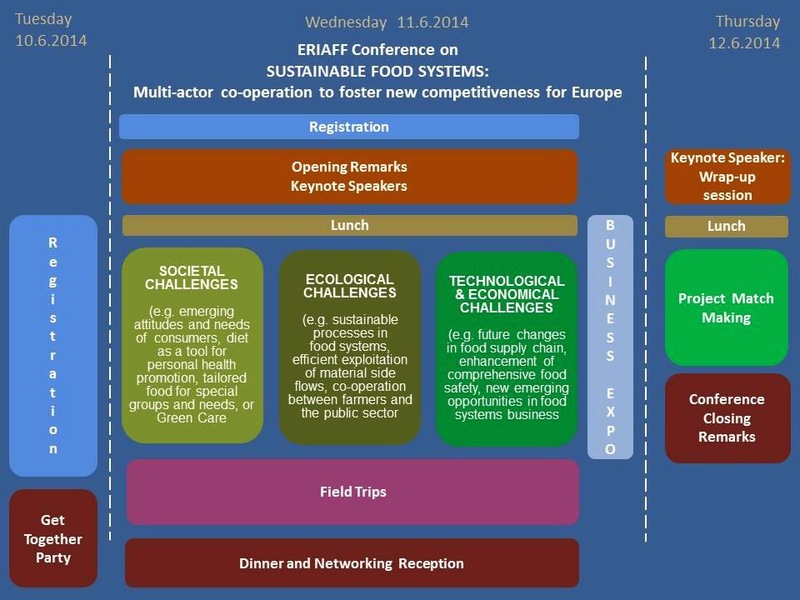 Send your comments via Twitter by using hastag #ERIAFF2014 of via http://eriaff.seamk.fi (LINK). I do always read articles about conference venue finder because I want to all the beautiful place that our company can visit. I saw different awesome venue that is beautiful, elegant and affordable, but I notice your article contain a very unique venue. I found your blog is so interesting and it is good to share with my officemates.